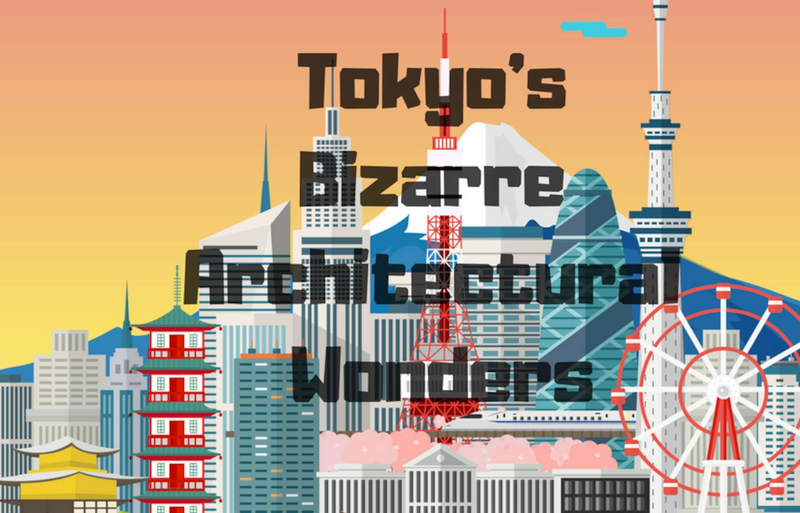 Tokyo's bizarre architecture provides some the city's best tourist attractions and photo opportunities, ranging from a Buddhist temple that resembles a spaceship to Tokyo's most iconic capsule hotel. Let's have a look at five of the best examples around the city! Among the myriad structures in Tokyo's sprawling urban landscape, there are gems of architectural wonder to be found. Said wonders come in a variety interesting and unique forms throughout Japan's hyper-stylized capital—there are those that are very old (Senso-ji Temple), and those that are impossibly large (Tokyo Skytree)—but here we will focus on those that are just downright bizarre. Japan is a country renowned for its eccentricity, and this is especially evident in Tokyo's diverse buildings. So, let's have a look at some of the city's quirkiest architectural designs! One of Tokyo's most unusual buildings is located in the Jingumae area of Shibuya. The asymmetric, urban design seems to laugh in the face of physics, and is reminiscent of a giant crystal of ice. Hence its nickname, "The Iceberg." Built in 2006 by the firm Creative Designers International, this seven story building isn't overly noteworthy in terms of its usage—the ground floor is a former showroom for automotive company Audi, and the remaining six floors are used as offices and spaces for art exhibitions. The building's aesthetic however is definitely extraordinary. According to CDI director Hiroyuki Yoshikawa, the inspiration for the building came from a mix of "a crystal iceberg and a plastic bottle after going through a shredder." This unique combination of inspirations gives it an outward appearance unlike anything else you will come across in the city. It looks particularly resplendent in the sunlight, with an iridescent blue tinge emanating from its crystalline facade. Designed by Nikken Seikei and completed in 1989—the same year the company changed its name to Asahi Breweries, Ltd.—Japan's Asahi HQ was clearly created with a sense of humor in mind, since it's is allegedly shaped like "a beer mug full of bubbles." The quirkiness in design doesn't stop there! The adjacent "Super Dry Hall" (named after the company's flagship beer), was designed by Philippe Starck, and it sports a large, golden flame-like object upon its roof appropriately called "The Golden Flame," though the name given to it by locals is decidedly less inspiring. Located near the Sumida River, Tokyo's Asahi Beer Tower is impossible to miss, especially if you exit Asakusa Station from the eastern side—the 22-story structure and the accompanying "Golden Flame" dominate the immediate skyline. The tower's amber glass panels and white-walled top do evoke the imagery of a freshly poured pint, and on a nice day it's bound to make you thirsty! Thankfully you're in the right area to have it quenched, between the Super Dry Hall and "Hoppy Dori" only a stone's throw away. Nakagin Capsule Tower is another piece of Tokyo's architecture that is immediately noticeable due to it's striking aesthetic. The tower block's appearance is akin to a giant (if poorly constructed) tower of Lego blocks, each with a window at its end. The Capsule Tower was built in 1972, and at the time was viewed by many as a beautiful example of architectural genius. However, as a result of poor upkeep over the past few decades, it now looks more like a confused mess of rusted washing machines. When it was initially constructed it was emblematic of the Japanese "Metabolist" architectural movement that fused ideas of architectural mega-structures with those of organic biological growth—reflecting Japan's movement from a rural to a modern society. The building contains 140 separate "pods," complete with '70s amenities (corded telephone, stove, refrigerator, shower and tape deck) which were originally used as swanky accommodation options for Tokyo's corporate elites. Unfortunately, the pods have scarcely changed since their original inception, meaning Nakagin Capsule Tower is now a relic of the past, and a building that has long been approaching its final days. The Reiyukai Shakaden (霊友会, or "Spiritual-Friendship-Association") Temple in Minato is a giant Buddhist temple in central Tokyo, built for the Reiyukai Buddhist movement. Constructed on the site of the former Reiyukai headquarters hall and finished in 1975, this black granite monster of a structure displays very few characteristics that one would typically associate with a Buddhist Temple—the outward appearance is more like an alien spaceship or a giant trilobite fossil, with its gaping mouth as the hall's entrance. The temple undeniably provides a great photo opportunity, but visitors are also more than welcome to take a peek inside—here you can marvel at the giant Buddha statue, learn more about Reiyukai philosophy, wander around the main meeting hall and maybe even take a few free Japanese lessons! Returning to Ginza we have the last entry on our list, the multipurpose V88 building—and no, the above picture has not been photoshopped! 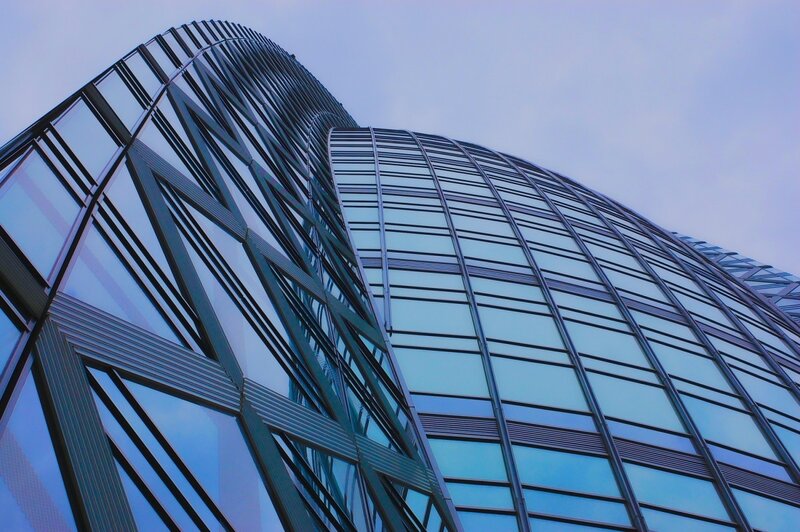 The skyscraper's wavy design was based on the idea of an aurora light wave coming out of the ground and reflecting the changing patterns in the sky, with the curves also intended to represent the "beautiful silhouette of a woman." Another wonderful by-product of V88's curved design means that its expression and shape appear different depending on the viewpoint from which you are looking at it. Its near the Marronnier Gate is appropriate, as the avenue is known for buildings of unusual design and ostentatious grandeur. Another apt characteristic is that the ground floor of V88 was home to De Beers Jewellers, the ethereal beauty of its architecture once matching that of the diamonds on display inside. Diamonds and Ginza do not go well together if you are on a budget, but this unique structure is certainly worth a quick look if you find yourself in Tokyo's most glamorous downtown area.